John Tirpak, far right, accepting the hand-embroidered flag award for Foss. The flag is made by a Philadelphia based woman-owned business in the spirit of Betsy Ross. When Sandy struck New York and New Jersey in October 2012, Foss applied lessons learned from the 2010 Haiti earthquake. A year after Hurricane Sandy struck America's East Coast, the federal government has honored Foss Maritime Company for its part in critical relief work. Vice Admiral Mark D. Harnitchek, director, Defense Logistics Agency (DLA), made the award to the Seattle-based company during a ceremony at the agency's headquarters, citing its ability to quickly move personnel and equipment to devastated, hard-to-reach locations in New York and the New Jersey shore. 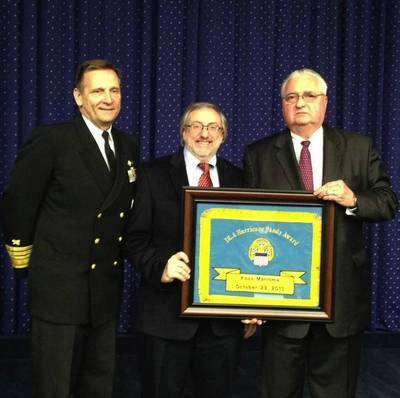 Foss Maritime's John Tirpak was on hand to accept the honor from Vice Admiral Harnitchek and the DLA. "Foss is proud to have done its part in Sandy's aftermath," he said. "We were able to respond quickly because of our peoples' unique skills and their on-the-ground experience in disaster areas." Even before Sandy had finished its deadly October 2012 rampage in New York and New Jersey, the DLA had contacted Foss to provide disaster relief in some of the East Coast's hardest hit areas. Communities were struggling to cope with a tidal surge and high winds that Sandy brought in its wake. Subways and rail lines were under water, people were trapped in homes and apartments, hospitals and vital communications centers were without power. In the aftermath of the storm, delays in providing aid could cost lives. The Defense Logistics Agency and US Transportation Command contacted Tirpak who assembled the Foss team and nominated Robert Wagoner as Incident Commander on the ground. "Foss was contacted during Sandy in part because of the work we'd done in Haiti in partnership with the U.S. government," said Robert Wagoner, who oversaw Foss' role in helping deliver tens of thousands of tons of food to the earthquake-torn country and rebuild the island-nation's main port. "The United States Transportation Command and the Defense Logistics Agency were well aware of Foss' capabilities in the face of a natural disaster." Within hours of the call Foss was moving relief supplies to New York and New Jersey. The company mobilized 20 pumps, six generators and personnel to operate the equipment from locations across the United States, trucking or flying them to Naval Air Station Lakehurst, NJ. The U.S. Army Corps of Engineers marshaled the equipment for deployment from there. "We knew from our work in Haiti that we had to get the necessary equipment - and the right people - to affected areas as quickly as possible," said Wagoner. "And we knew from experience that we'd be entering a situation where chaos reigned, communication would be difficult if not impossible, roadways impassable and people were in fear for their lives." It proved true in Sandy's wake. But with an experienced team and partnership, Foss and the DLA were able to mobilize quickly and avert an even larger scale disaster. Tirpak said, "When our country calls, Foss stands at the ready."